Welcome to the perfect vacation resort in the Marina Residence of Paradise Village. 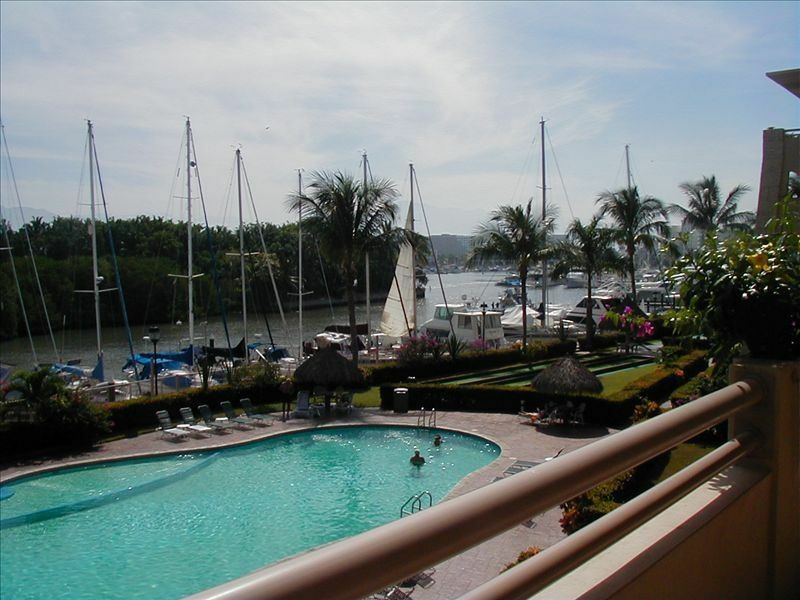 In our condominium, you will wake up to a breathtaking view overlooking the marina and swimming pool from the large, private balcony. The unit is on the 3rd floor and has 2 bedrooms and 2 bath (master bath includes jacuzzi). It has a beautifully furnished living room and dining room, with a full kitchen and washer and dryer. This is a corner unit which has extra windows in the living room that allows for a better view and more light. The stairs and the elevator are conveniently located just outside the front door for a quick ride down to the pool or to the Paradise Village mall. In addition to full use of the quiet and secluded swimming pool, barbeque, putting green, palapas and botchi ball, guests have use of the shuttle that runs every 1/2 hour and takes you to the beach club at Playa Royale. There, for a small fee, you will have full use of the beach front swimming pool with hot tub, sauna, steam room, small private palapas on the beach, children's pool and play area, locker room with showers, beach chairs and towels. The same shuttle will also take you to El Tigre Golf Course Sports Club that offers two pools, work out equipment, gymnasium, racket ball and tennis. One of the newest additions is the use of the beach club at Occidental-Allegra Resort. This is an all-inclusive offer, where for a fee you can enjoy full access to the resort, except for rooms, and have all you can eat and drink. This resort is located across the street from the Marina Residence and Paradise Village shopping center mall and no shuttle is required. We recently stayed in this unit - which is very comfortable and nice. It has lovely views of the marina and the pool; we had plenty of room. A few things to note: the DVD player doesn't work, the internet access is temperamental; you have to purchase everything, including dish and laundry soap. Maria Luisa is very helpful. In Nuevo Vallarta, there is absolutely NO beach access without paying for it. We understood that we could use the Playa Royale Beach Club (for $15 per person per day), but we didn't understand that we *had* to use it. The Occidental Grand is also available for $55 per person per day (food/drink included until 4 pm). The security guard at the Playa Royale refused to let us in, and we spent several hours trying to sort it out. So, if you want to even walk on the beach, realize that the Marina Residences are difficult. Thanks for this information, I want to inform all future renters that this condo has the same rules as most units at Paradise Village Marina Residence. The beach club use at Paradise Village Playa Royale for $15 a person is for the day you want to go there. You "do not" have to use or pay for the Beach Club if you do not want to go there. The security gate for the beach club is located at one entrance and allows guest to enter and pay the fee, all other entrances for Playa Royale is for owners only. The shuttle from the front of the Mall will take directly into Playa Royale beach club in 3-5 minutes.